PASADENA >> An Azusa man admitted breaking into a Glendale woman’s home and sexually assaulting her at knifepoint before being chased away by her adult son in 2015, officials said. Justin Amador Rios, 20, pleaded guilty Thursday in to one count of forcible sexual penetration in the Pasadena branch of Los Angeles County Superior Court, Los Angeles County District Attorney’s Office spokesman Ricardo Santiago said. Rios also admitted to a special allegation that he personally used a knife in the crime. The attack took place on June 3, 2015, in the 900 block of Orange Grove Avenue, officials said. Glendale police found and arrested Rios in connection with the attack the following day. Two additional counts of forcible oral copulation and one additional count of burglary were dismissed during Thursday’s hearing, which was the result of a negotiated plea arrangement, according to Santiago and court records. Rios is expected to receive 24 years to life in state prison when he returns to court for sentencing on May 16, Santiago said. The Glendale Police Department is asking for the public’s help in locating Megan Sue Dipiazza. She was last seen on the evening of November 11, 2012. A note was discovered “saying goodbye to her family.” Megan has a history of depression. There is no indication of foul play. No suspicious activity has been identified. The Police Department would like to speak with Megan Dipiazza. The family is concerned for her welfare and has been working closely with the Police Department. Last week a police spokesman said he believed DiPiazza was in the company of “people”. On Monday a second spokesman recanted that statement. Meanwhile, DiPiazza’s friends continue to search for her or her car, a “2013 Gray Toyota Scion.” The car has license plates of 6XJR885, but those plates may not be attached, according to Glendale PD. MONTROSE – Investigators on Wednesday asked for those who know the whereabouts of Megan Sue DiPiazza, the Montrose mother who went missing Sunday night, to come forward with information about the 33-year-old woman. DiPiazza disappeared from her house Sunday night. She left behind a note “saying goodbye to her family,” Glendale police Sgt. Thomas Lorenz said Wednesday. The department said foul play is not suspected in the disappearance. Glendale police officials didn’t know why the Montrose mother left her family but said DiPiazza suffers from depression. Here’s a link to our excellent photo gallery. On October 8, 2008, at 1:55 a.m., Manual Martin was riding his motorcycle on the eastbound 210 Freeway while transitioning to the southbound 2 Freeway in the city of Glendale. A car pulled up next to him, and within a few seconds, the occupants fired thirteen shots. Martin was shot once in the chest and died within minutes. Seven additional bullets hit his motorcycle. The Glendale Police Department investigated the murder and identified the suspects as members of a local street gang. Their investigation also revealed that the gang was responsible for other crimes. Los Angeles Police Chief William Bratton says officers have arrested 19 members of one of the city’s most violent gangs. The arrests Thursday by Los Angeles and suburban Glendale police were the result of a 10-month investigation of the Toonerville gang. October, Glendale police used a wiretap and discovered key evidence that led to the arrests. suspects were arrested in the early morning raid. Police found 48 guns in one house and 63 guns in all. GLENDALE – Police are searching for a dark-colored car that may have been involved in the shooting death of a motorcyclist on the Glendale (2) Freeway. An autopsy was performed on the victim Thursday, but the results were not available, authorities said. Manuel Vincent Martin, 30, suffered a bullet wound in the chest but had no other major visible injuries, according to Los Angeles County Department of Coroner spokesman Craig Harvey. Police confirmed Thursday that another motorcyclist riding with Martin was wearing a Mongols Motorcycle Club T-shirt. 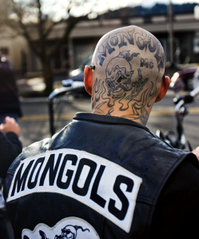 The Mongols, a biker gang that originated in Montebello in the 1970s, has been warring with the Hell’s Angels. Gang involvement is being investigated as a possible motive in the slaying, according to Glendale Police Department Sgt. Tom Lorenz. Several people showed up to the crime scene following the shooting, Lorenz said. “The Police Department has not ruled out any outlaw biker activity that may have caused this event,” he added. Palm Springs Police Chief David Dominguez told merchants this week that while there have been recent incidents around the state between rival motorcycle gangs, he does not expect violence during this weekend’s event. “They (the motorcycle groups) have let us know they are coming and they just want to have fun,” Dominguez said. Earlier this year, Dominguez warned the City Council that he was concerned about rising incidents among the Mongols, Vagos and Hells Angels motorcycle gangs. He said this week that there is always a chance that something could happen, but his department will be prepared. There will be a heavy presence of uniformed officers throughout the weekend, as well as volunteer and off-duty law enforcement officers who will be in town showing off their own bikes, Dominguez said. Burke said he will also have security on hand to ensure a family-friendly event. “I think we will be fine,” Dominguez said. 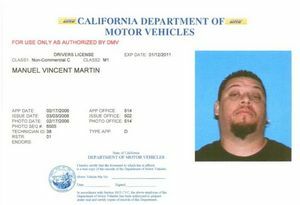 Here’s a photo of Manuel Martin supplied by the DMV. Martin was apparently shot and killed at the 210 2 connector on the Glendale La Canada border early Wednesday morning, officials said. He was 30. Police are working two theories in regard to the incident. The first is that Martin may have been killed as a result of road rage. The second involves a fellow motorcyclist’sapparentaffiliationwiththeMongols outlaw motorcycle gang and an ongoing feud between the Hell’s Angels andMongols. Police don’t know (or wont’ say) if Martin was a Mongol. A motorcyclist who was shot to death on a freeway in Glendale may have been a member of the Montebello-based Mongols motorcycle gang, authorities said Wednesday. The shooting occurred about 2 a.m. And the connector linking the 2 and the 210 was shut down for most of the morning, authorities said. 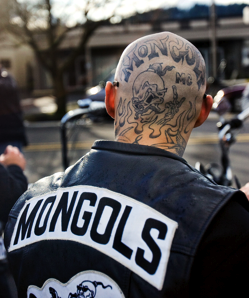 The death may be the latest chapter in a feud between the Mongols and the Hells Angels. In early September, Hells Angels leader Mark “Papa: Guardado was shot to death in San Francisco’s Mission District. Christopher Ablett, a Modesto member of the Mongols is believed to be responsible for the slaying, according to witnesses. Guardado was killed about a mile from the Hells Angels clubhouse on Tennessee Street, where he lived as head of what the group calls the Frisco chapter. Police say murder charges were filed against Ablett in San Francisco earlier this week. He is considered armed and dangerous, and is being sought on a $5 million arrest warrant. Homicide Inspector Karen Lynch declined to elaborate on a possible motive for the killing, other than to say Guardado and Ablett apparently argued on the street before the shooting. Ablett is a freelance electrician who lives with his parents in a suburban neighborhood of Modesto. BARTLESVILLE, Okla. (AP) – The man police think killed the leader of the San Francisco Hells Angels motorcycle gang last month surprised a smalltown police force in Oklahoma by turning himself in. Bartlesville Police Chief Tom Holland says Christopher Ablett showed up to surrender Sunday. Holland says Ablett was “as polite as could be,” and not someone you’d think killed anyone. Ablett is said to be part of a rival motorcycle gang fueding with the Hells Angels. ** The official Mongols Web site is here. ***The dead man has been identified as Manuel V. Martin, of Torrance or Venice. He was 30 years old.